We're not going to lie: There's something that we find slightly repulsive about Jell-O as a food product. It's so...jiggly. It's kind of like swallowing a mouthful of squiggly little fruit-flavored worms, which no one should ever have to do. (Exception: When eating gummy worms.) 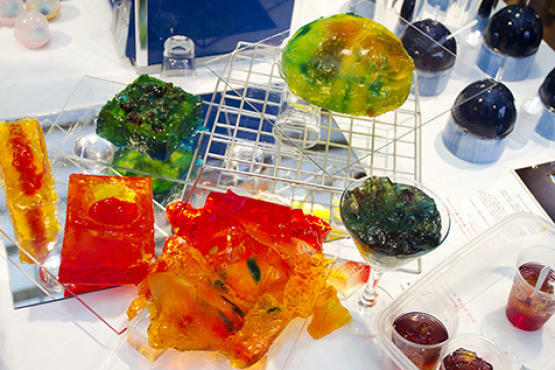 But while we find Jell-O disgusting to consume, we do enjoy its use as an artistic medium, as it was in the second annual Jell-O Mold Competition at Gowanus Studio Space. Blobs of gelatin were forced into new and interesting shapes—like a Tiffany lamp and small statuettes of the Virgin Mary—and the crowd got to sample each piece once the show was over. You can't convince us that Jell-O is good to eat, but it is fun to look at.